Let’s face it, freight costs are rising as a result of the capacity crunch and driver shortage. Even shipping full truckload isn’t as cost-efficient as it used to be. The dawn of e-commerce ordering has increased the number of shipments as well as made consumers’ expectations higher. Truck drivers are steadily aging out of the workforce as they hit retirement age and other generations aren’t taking up the mantle. The supply chain is one of the largest cost centers for any business, so finding ways to save on truckload freight is a top priority. You have the most control over your own internal processes, that’s why streamlining how you and your logistics team works is low hanging fruit for saving money on truckload shipping. Leveraging a transportation management system will help you save time rating, booking and tracking your TL orders. Less time spent will help you save on labor costs and let you reallocate your team’s time to other, more productive uses. Increasing the lead time of your full truckload shipments will help you save on shipping costs. If you work several days ahead, you won’t have to pay higher rates for last-minute capacity and will have a wider selection of carriers to choose from. It also helps your carriers better manage their time and plan routes more effectively. All of these positives trickle down to the end customer to meet their high expectations. Recording everything by hand and manually dialing up carriers for every truckload shipment is old-fashioned and inefficient. Not only that, it can cost a company when mistakes are made due to human error. If the order quantity or weight was entered incorrectly, the paperwork is likely to get messed up and getting paid can become a struggle. Instead at CargoBarn we integrate our TMS with our ERP system to automatically flow information between systems. This will ensure that documents like BOLs are correct every time. It also makes our team more efficient if they aren’t re-keying information back and forth between systems. By creating a way to communicate and collaborate more efficiently with carriers, companies can lower their overall freight spend on FTL shipping. Collaboration portals have become a popular way for companies and carriers to exchange information about order statuses and delays in real-time. At CargoBarn we even integrate with trucks’ internal ELDs or RFIDs to alert all stakeholders where the truck is at all times. Collaborating for a higher level of visibility will help companies save on detention charges, plan labor more correctly, and meet their customers’ expectations. Besides creating a method for a heightened level of collaboration with your carriers, you should also treat them with the same respect you would any other partner. Make sure to pay your bills on time, work to get them in and out of the yard quickly, and make sure expectations are clear ahead of time (ie: who is unloading the truck). All of these actions will help you form a relationship where carriers want to do business with you. In a market where capacity is scarce, having first dibs on the best capacity will help you save money. Accessorials are a tricky thing for most companies to manage, they’re hard to budget for and can often go unnoticed until it’s too late. In order to keep overall truckload costs down, you should be constantly monitoring and evaluating your accessorial charges. If you’re consistently being penalized for loads which are overweight, try to find the root cause and address why the carrier is being told the wrong weight. Communicating all unusual circumstances ahead of time will often lead to lower charges than if the carrier discovers them mid-trip. As a truckload shipper, you are in a unique position to leverage your volume. Instead of working with dozens of different carriers and only giving each one a small percentage of your volume, identify your preferred carriers and establish routine, reliable lanes with them. They may be able to offer you a discounted rate based on the fact that it’s repeat business. This strategy is good for everyone involved – it helps you maintain enough capacity to ship your freight, lets the carrier plan their routes more efficiently, and results in better service to the end customer. There will always be circumstances where your regular or preferred carriers can’t fulfill a truckload you need shipped. Maybe it’s a last minute shipment or maybe it’s going to a new destination. Whatever the cause, sometimes you need to find truckload capacity fast. In these situations, it’s best to have a plan to access the spot market. Spot markets are places where companies can go to have different carriers bid on their freight. From there, they can select the best bid and book their freight. If you have freight to ship and are looking for additional capacity, you can request and receive truckload quotes from CargoBarn! The supply chain industry isn’t for the faint of heart. You need to be constantly ready for unforeseen events like inclement weather, mechanical failure, or anything else. Having visibility to all of your orders down to the SKU level will help companies react to situations that they can’t plan for. Having all of the information needed in one place will help companies answer questions like ‘Where’s my order?’ and ‘when is the truck arriving?’ Staying flexible doesn’t only mean reacting to negative events though. Companies should stay flexible when booking their truckload shipments too. Just because the due date on an order is a specific day doesn’t mean that there isn’t an opportunity to deliver earlier or later in the day. At CargoBarn we work with all of your options to discover the best rates for each and every full truckload shipment. Just because ‘that’s how you’ve always done it’ doesn’t mean you can’t make a change. You’ve probably heard the saying that you can’t change what you don’t know. Tribal knowledge will only get you so far in this field. You might generally know that you’re being overcharged for a certain lane, or that a certain carrier seems to be late more often than not. Without analytics on your truckload shipments, however, it’s hard to make strategic changes. If you can see in a report that a carrier’s OTD percentage is low, you’ll be able to have a discussion with that carrier about the metrics. If you didn’t have those metrics, having that conversation would be much more one-sided. Analytics down the SKU level also helps companies calculate their freight cost per item and determine if they are making enough of a profit. With a TMS, all of these different metrics and many others are captured in one place for easy analysis. 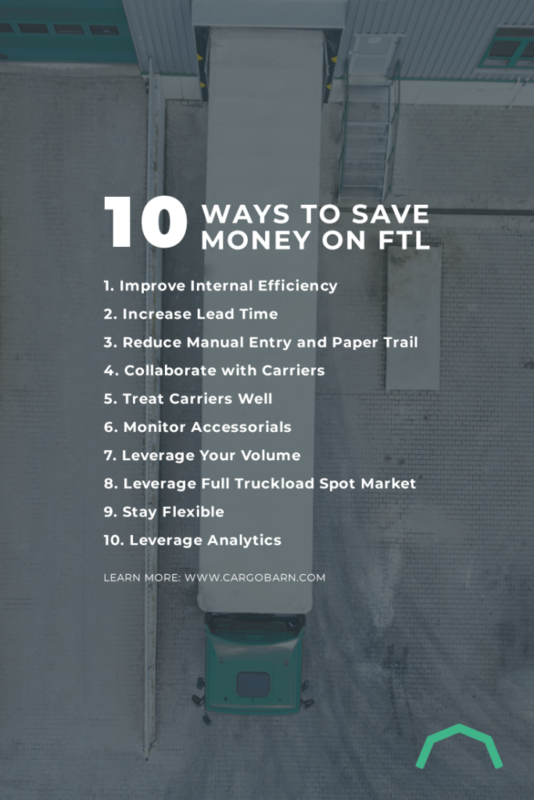 In order to save money on FTL, companies need to leverage technology to their advantage, communicate and collaborate with their external partners, and make a point of both planning ahead and reflecting on decisions made. Trends like the capacity crunch, driver shortage, and the increased popularity of e-commerce ordering aren’t going anywhere. It’s up to each company to figure out how they are going to save money on their truckload freight and turn their supply chain into a profit center.